Cod are spawning now. 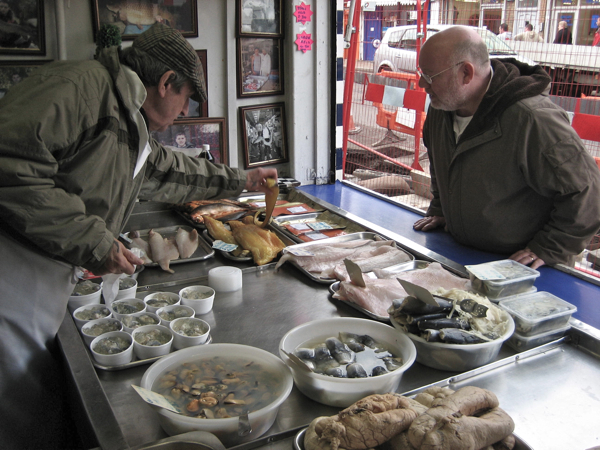 We are in that short season of four to five weeks each Spring when fresh Cod roe is available – and fishmonger Tom Disson has his supply, that he boiled up at the back of his shop in the Roman Rd, on sale now. 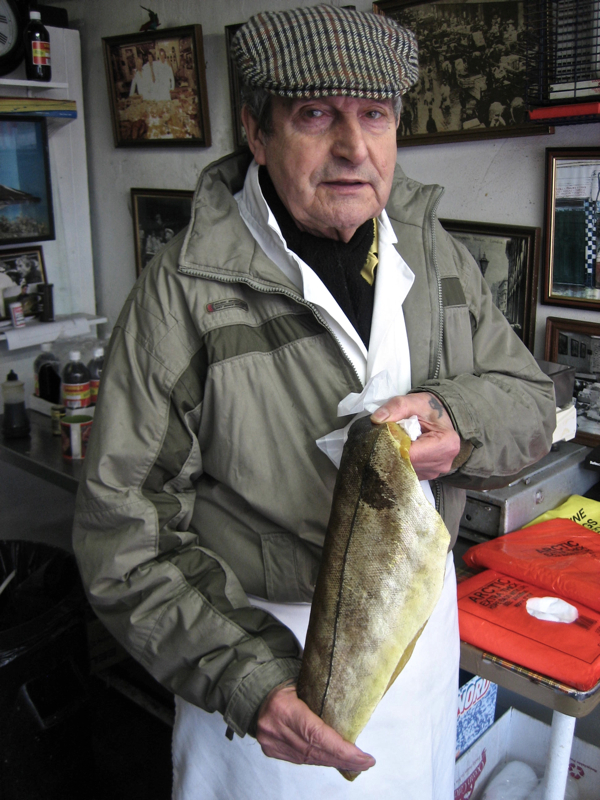 Tom’s long-standing East End customers are eager to enjoy this celebrated annual treat – far superior to the frozen variety – delicious spread on toast or prepared in the traditional manner, sliced and deep fried in batter. 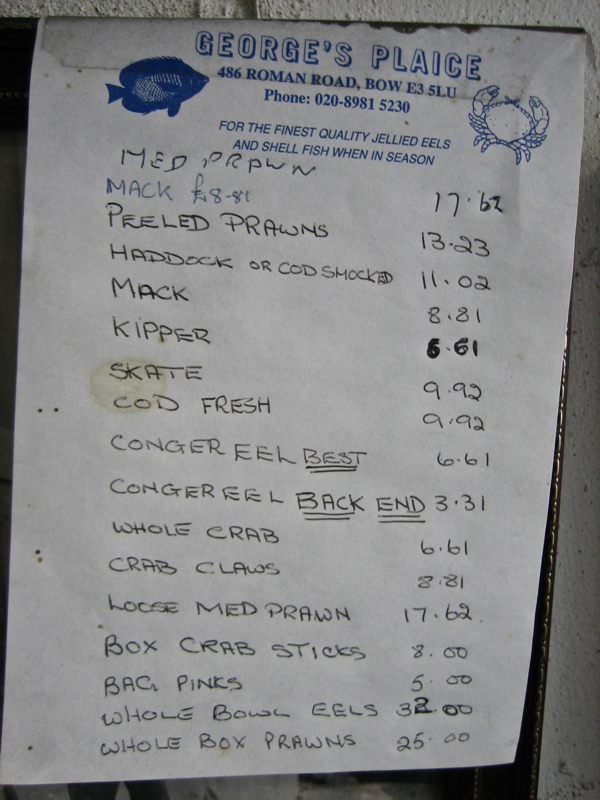 From behind the counter yesterday, viewing the world through the narrow frame of the shopfront at “George’s Plaice,” I watched them all come along and halt in their tracks to admire Tom’s magnificent display of steaming Cod roe glistening on the slab. Tom knows his customers by name and our conversation was regularly punctuated as Tom turned his head to utter a greeting to each person that appeared in the field of his peripheral vision, flitting past the shop window - “Hello Mary Love!”- “Hello Ted!” – “Hello Ginger!” There has been a fishmonger on this site since 1898 and today “George’s Plaice” is the centre of the world in the Roman Rd, where customers come to introduce their daughters to cockles and to order jellied eels for their mother’s funeral, while Tom keeps everything buoyant with constant flow of banter, both lewd and lugubrious by turns. “Are you looking for service? I’m feeling chesty today.” proposed Tom with a provocative comedy smirk as his customers scrutinised the kippers, heroically suppressing the heavy cold that is getting him down. “My dog had a wart on its ear and do you know what it cost me? – £387 to have it removed!” protested Tom, sharing his affront at the iniquity of our times, with Rene who matched it with an account of her greyhound’s broken leg that cost £475 to set, a statement countered by Tom’s revelation that his dog required cream for its foot, to stop it scratching, that cost £85. 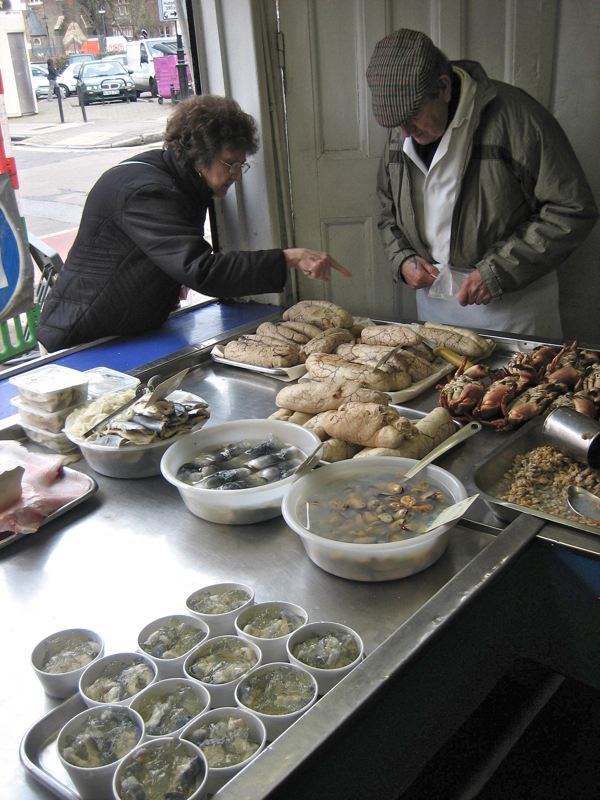 A resultant empathetic silence of mutual outrage prevailed while Tom wrapped up Rene’s fish, before an exchange of genial smiles accompanied the close of the transaction. 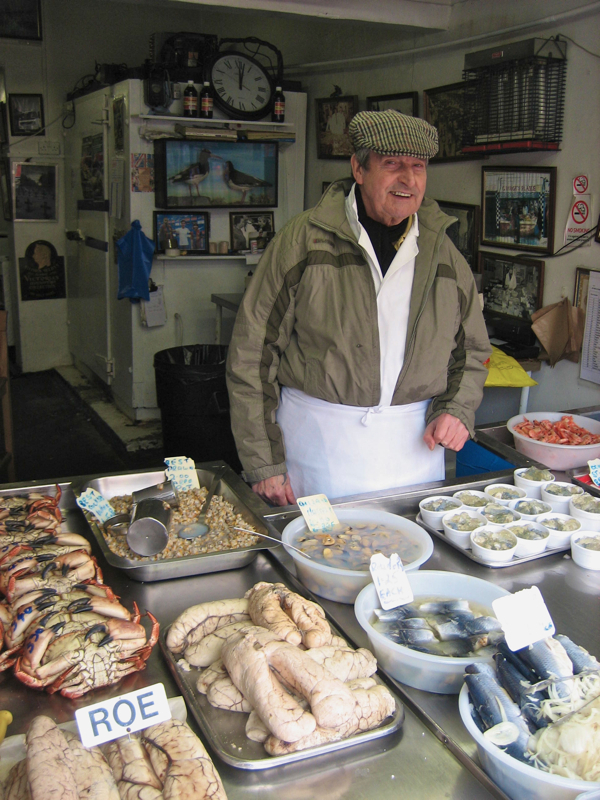 Tom has decorated his walls over the last thirty years with an appealing gallery of pictures, some of the old East End, others of himself in former days – with two stuffed oystercatchers in a glass box as the centrepiece of the shop. 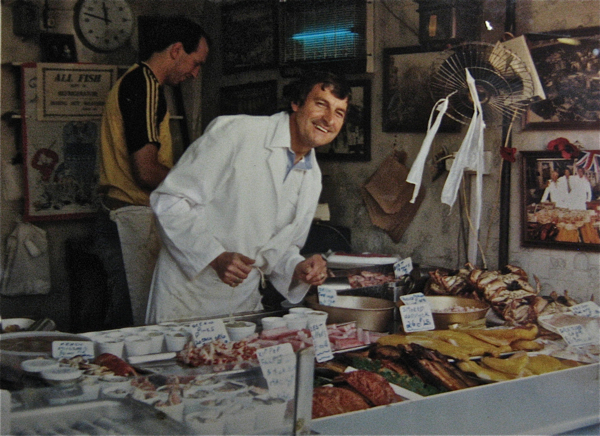 And the view from the pavement, looking across the expanse of coloured fish to where Tom stands in his white apron and flat cap with the backdrop of framed pictures is a memorable spectacle. 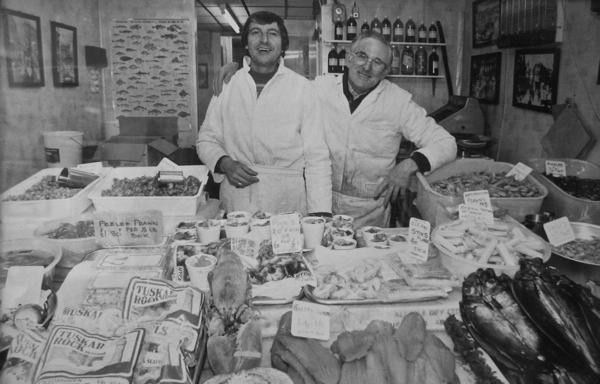 Week in, week out, through all weathers, Tom sits keeping his fish company with his good pal Geoffrey (“East End born and bred”) a former publican. “There used to be thirty-two pubs between here and Shoreditch, but if there’s eight now it’s a lot,” posited Geoffrey regretfully, in a quiet moment yesterday. “We’ve definitely seen the best days,” agreed Tom, nodding with a sardonic grimace, playing Vladimir to Geoffrey’s Estragon in this fish shop re-enactment of “Waiting for Godot.” “Years ago, you had so much banter with the people, we used to have queues both ways on a Saturday morning!” continued Tom, crossing his arms, gazing across the gleaming fish for consolation, and smiling fondly in a reverie of the glory days of fishmongery in the Roman Rd. Yet the moment a customer appeared, Tom and Geoffrey both sprang into animated life, eager to please, because they appreciate the esteem with which the local people hold this shop – as an unchanging landmark and reminder of the time when people always greeted each other in this neighbourhood. For Tom Disson, it is no duty, it is his joy, because this is his community. 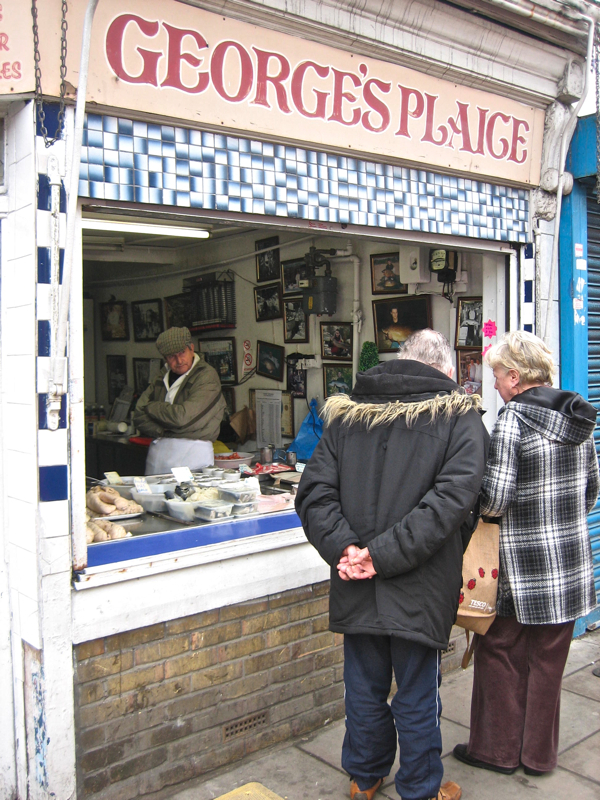 His customers may be aging but the affection with which “George’s Plaice” is held by the populace of the Roman Rd ensures that this performance is destined to run on for a few more years yet. 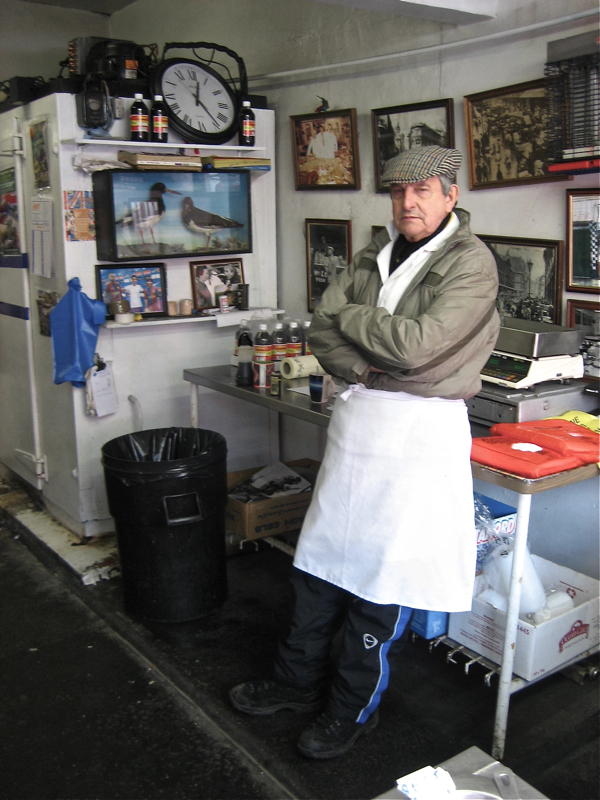 And in the meantime, you must take the chance to visit the last old fish shop in the East End, and enjoy for yourself the rare delicacy of freshly boiled Cod’s roe while it is still in season. Tom waits while customers deliberate over the Skate. A satisfied customer, delighted with her Cod Roe. Tom’s magnificent display of freshly boiled Cod roe. when Hamish my son was born 26 years ago, folks down the Roman used to give silver as good luck to newborns. Tom gave me 20p for Hamish. 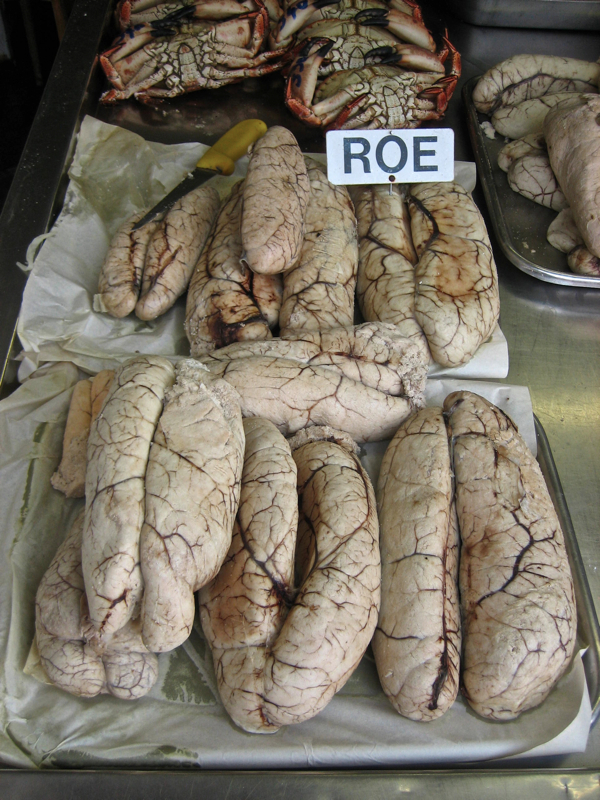 I still adore your website, but wish people would stop eating fish roe. To trawl for fish during their spawning season is adding to the depletion of fish stocks,and ultimately the endangerment of species, just so that unthinking people can have the species of fish on their table that they demand. The sale of cod roe is a by-product of these selfish actions. 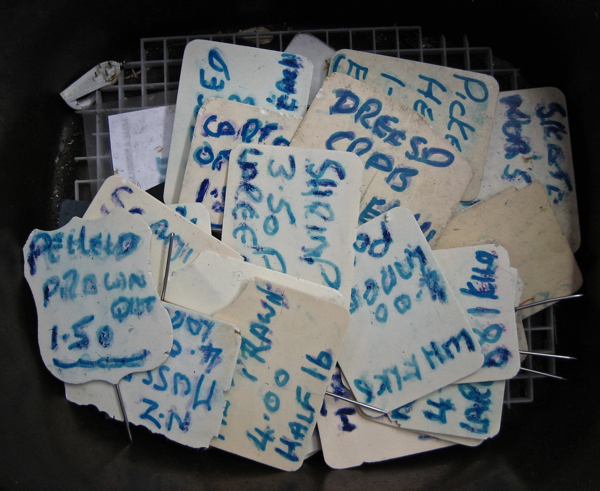 Cod spawn mostly between March and April. If we didn’t buy cod then, the fleets would decide to land less of them and more other species. The rock eel (rock salmon to you) is now also on the critically endanger species list. Lovely story about a small local business still managing to struggle on. Great pictures, sadly, Tom’s view about “the best days are past us” are of course reflected in the pictures – the old pictures detail an array of fresh/shelffish offerings when the new pictures showcase a much more limited offering! Many of the local market/shops in London have seen better days. 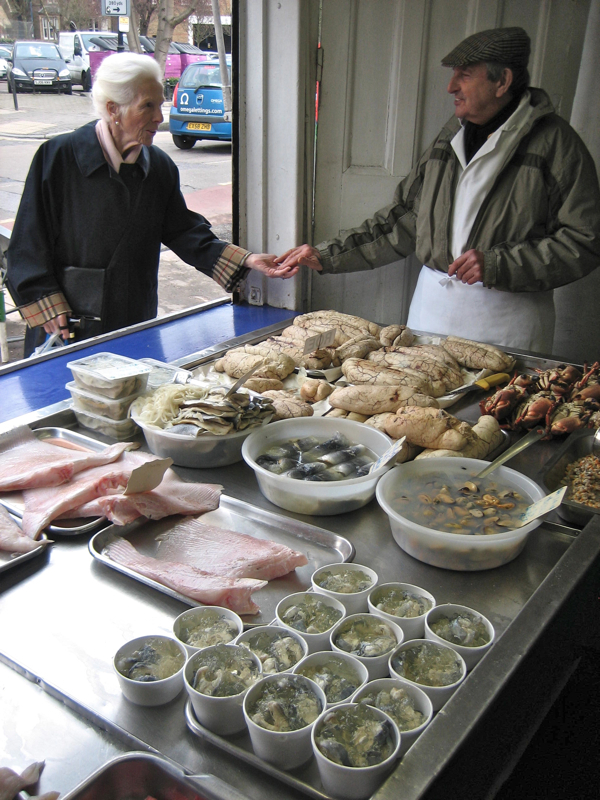 My family used to have fish stalls in Walthamstow and Ridley Road. My dad gave the last stall up in Walthamstow in 1999 due to falling trade and rapidly changing shopping habits! 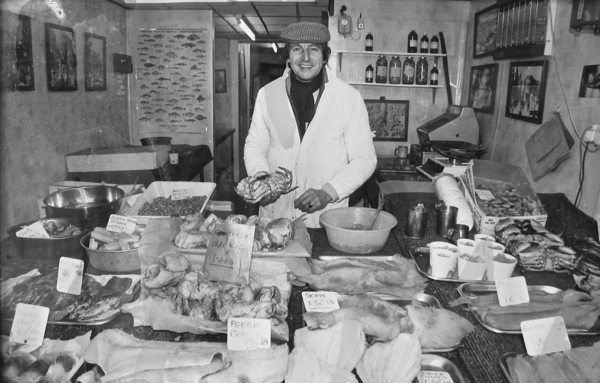 I remember the early 3am starts, the trip to billingsgate, loading up the van and then driving back to start a long day serving cold, icy fish on a barrow in High Street, Walthamstow and/or Ridley Road, Hackney. It is easy to get rose-tinted but I can assure you that whilst it was rewarding it was very hard! I don’t know many teenagers who would do that same job today. 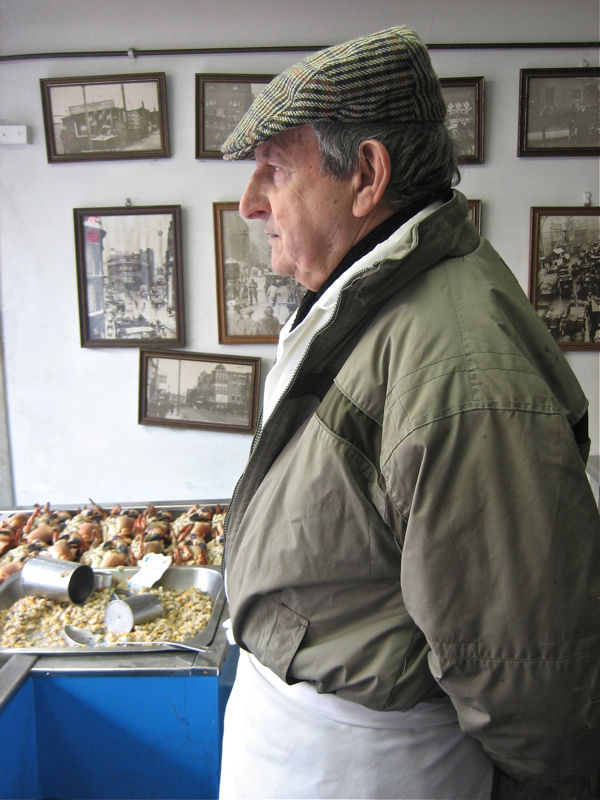 Best freshest sweetest cooked Iceland prawns in London – down there today April 7th & Tom D just as lovely to see as ever with his trademark ‘ glass [ very slightly ] half empty. 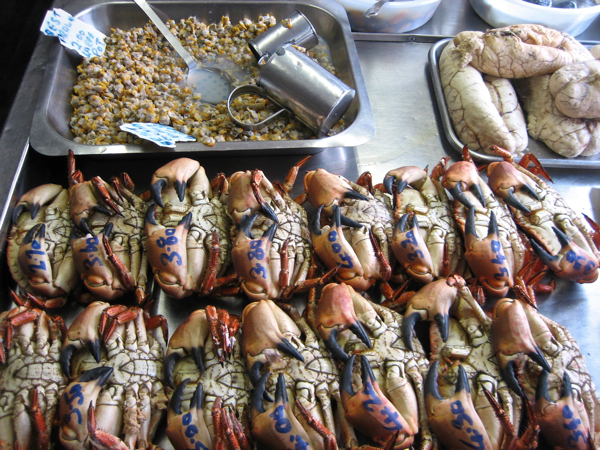 And yes , the amount of produce has diminished with the change of population and the ageing clientele – nevertheless Tom’s produce is top quality and his prices are the lowest for whole crab / dressed crab / claws etc., I’ve found ….. Delicious Tom D. Well done You.